Even if we are in a roaring bull market there are many occasions within a bull market where we are close to localized market peaks that can lead to corrections of 10% or more. 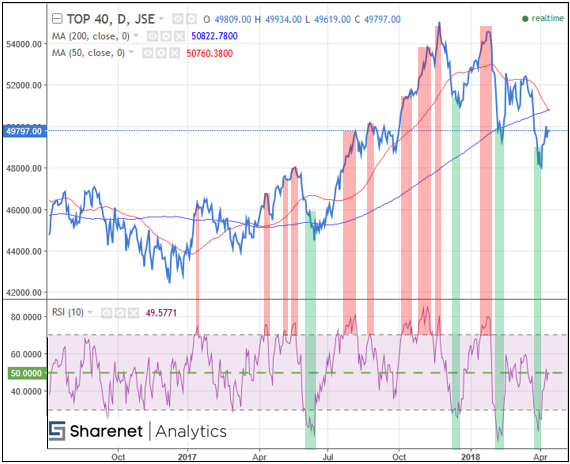 This is not the time to be short-term trading on the long side because if the JSE suffers a 10% correction it most likely will drag all the shares down with it, regardless of how good their fundamentals look. It is thus extremely important for the short-term trader to be able to identify those periods most conducive to the JSE having positive short-term future outcomes, or most conducive to having negative short-term outcomes. Remember "a rising tide floats all boats"? 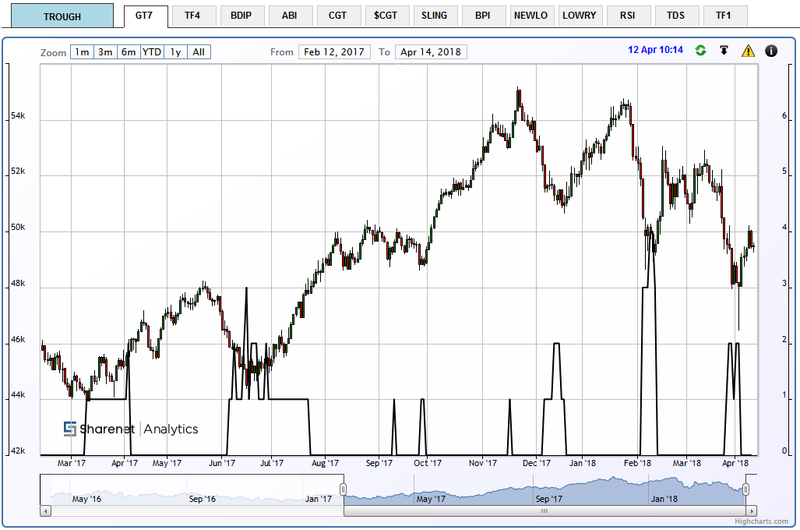 These periods are normally near large troughs that roughly approximate when a healthy JSE correction is likely to bottom. By focusing on these areas, you can avoid picking stocks near a major top. Another thing to bear in mind is that if the overall JSE index is down some 10% to 15% in a trough, you will be finding trading candidates that are down 20% to 30%. This is a great opportunity if you are buying near the bottom but not so great if you bought just before the JSE embarked on a correction. Generally, if the RSI is below 50 the market is "short-term bearish" and if its above 50 its "short-term not so bearish"
If the J200 50-day moving average is above the 200-day moving average odds are high we are in a sustained uptrend, otherwise the odds are high we are in a sustained down-trend. When the 50-day crosses up or below the 200-day average these are referred to as "golden cross" or "death cross" respectively. There are probably many other Technical Analysis tools that achieve the same thing. Either way, you are going to need the basic "tools of the trade" to determine these, which is a Charting Program. You can buy some software for a few thousand Rand and then pay around R280pm for a daily update of the JSE share prices, or you could use the charts provided by your online stock broker (these are normally very basic though and not mobile friendly). My team have put together the�most comprehensive and cost-effective online, fully mobile-device-ready Advanced Charting program in SA with intraday price updates which is available (along with a ton of other things) through the MySharenet subscription for a mere R127 per month. If you are a Sharenet Securities client, this all comes for free. For a long-term view of the signal please click here to open picture. Bear in mind that this is a short-term signal, so its readings need to be taken in context with the long-term macro we discussed in Part-1. If the long-term macro is indicating high probability of a bear market, then you will be taking signals from GT7 (or any other tools you opt to use) with some circumspection. So, before you commit to that trade, ask yourself if now is a risky time or a good time to be in the market. But understand, that the best times will normally be accompanied by the most pessimistic narrative (that’s why the markets are correcting) and the worst times are normally characterised by the most optimistic narrative (that’s why the market is making new highs) and its understanding this paradox that separates out the winning traders from the losers!